Searching for how to spend an evening in Dubai? Looking out for an unforgettable scenic cruise in the evening? Check out this article about the awesome cruise experience in Marina Dhow cruise. Read about the dhow, the history of the dhow cruise, the spectacular view of the Dubai Marina amidst live music and wonderful buffet dinner in a traditional Arabian Dhow. You may kindle an interest to take this cruise while in Dubai. Are you planning a holiday or already on a holiday in Dubai? Wondering whether to take a marina dhow cruise? Then you are on the right page, since this article describes the details of the show cruise and our experience of this cruise. The word dhow is commonly used in the Middle East to describe a traditional wooden vessel which was used for trading in the olden days with Iran and for pearl diving. They have been an icon of sea transportation in the history of the gulf. Dhows come in many sizes depending on the purpose for which they are used. With modernization dhows have been replaced with modern vessels. But to keep in touch with the history, dhows have been used nowadays for tourism and dhow cruise dinners. You may wonder how the concept of dhow cruise dinners evolved. It all started with a few entrepreneurs who began converting dhows into floating restaurants which could also provide dinner cruises in the Dubai creek. With tourism booming in Dubai, this idea spread and soon enough from only a handful of dhows in the 90s, now there are about 30 dhows in the Dubai Creek and about 8 in the Dubai Marina. Along with the dinner, you will find a variety of entertainment on board like live music, tanura dance etc. The Tanura dance is a Turkish dance, typically performed by a male dancer who spins in a flowing, decorated and lighted dress. The spins are fast, but the entire dance sequence is a very enthralling performance. Alexandra was one of the first dhows to begin operation in 2009 in the Dubai Marina. The dhow cruises operate in both the Dubai creek and the Dubai Marina. In this article I have described only Marina dhow cruise from my experience. The Dubai Marina is an artificial canal city along the Persian Gulf shore which resembles a Venetian tradition. Did you know that the Dubai Marina is the world's largest man made marina? No wonder it deserves a visit if you are in Dubai. The Marina area comprises of wonderfully architected skyscrapers including the Dubai Marina Yacht club, Dubai Marina Mall, large number of five star hotels. 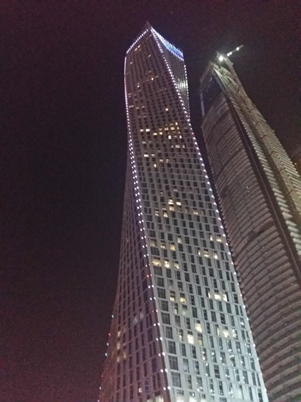 Each sky scraper is unique in terms of the look, the entrance, the design etc. There are several dhow operators and almost all of them provide similar services. Booking: You can book online, from the hotel or from a local tour operator. The prices are quite similar and reasonable. All dhow cruises includes hotel pick up and drop and cruise. Only the last cruise includes a buffet dinner. Nevertheless this dhow dinner cruise is the best one to take. Timings: The cruise tours operate nearly 8 times a day and 365 days of the year. Be it any day, you are sure to find a seat on this Marina dhow cruise and enjoy the Persian Gulf shoreline and the sky scrapers. Tips: Carry nothing, since food and water will be provided. Wear light clothing, since the weather will be pleasant. Do not forget to carry your camera, otherwise memories will be only in your heart! Hotel pick up and drop: You need to be ready at the hotel as per the instruction given by the tour operator. The ticket price includes pick up and drop from and to the hotel. Do not miss to watch the awesome lighting on the Burj Khalifa which clearly depicts the tall structure in the Dubai skyline. Dhow boarding: you will be taken from the hotel in a car/ van/ mini bus/ coach to the Dubai AMrina Promenade- West. This is located behind the Lotus Marina. You have to walk to the pier to board the dhow. Welcome on board: Before you board the dhow you can enjoy Arabic coffee and dates. Walk on the red carpet and board the dhow. You can choose to sit in the air condition or on the deck. The latter provides an open and clear view of the fascinating architectures but with no air condition. Introduction: A recorded announcement provides the detailed itinerary of the cruise. The tourists settle down on their tables and the cruise begins. Drinks and snacks : as soon as we settle down on our tables, the waiters start serving juice and snacks. For the vegetarians it was tasty samosas. Music: The speakers were playing melodious Arabic and English music in the background. This set a romantic mood for the cruise. Marina view: we enjoyed the view of the sky scrapers rising high on both sides of the marina. 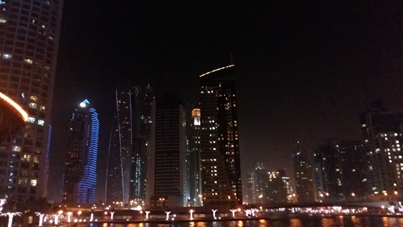 The five star hotels and the Dubai Marina residences were shining fabulously in the night. Right in the center of the sky was the half moon. Along the footpath we could see people relaxing on the benches or taking a walk. The dhow crossed several concrete bridges which allow vehicles to ply across the marina between the east and the west. We sat on the deck, it was pleasant and a little windy. Trust me, the view of the sky scrapers on both sides of the marina just were amazing! Dinner begins: The cruise staff announced a call for dinner. The buffet was multi cuisine, with soup, variety of salads, breads, Indian curry with cottage cheese, biryani, lentils, desserts etc. The tourists took their fill of the lip smacking wonderful dinner. Tanura dance: It was performed on both: the ground floor and the deck separately. The male dancer spun around and his beautifully decorated dress was moving like a saucer. It was a wonderful experience. Clear sea: As the Marina ended, the canal opened up into the clear sea, the Persian Gulf. We cruised around for some time, seeing the tall sky scrapers, a light far away view of the Atlantis. There were many other dhows around us. Return journey: The dinner was on and we all were enjoying the glimpse of the beautiful architectures of the buildings around us. The to and fro journey provided different views of the marina. It was as if the buildings were touching the moon. This was truly an incredible experience. Back to the pier: as every journey ends, our wonderful marina dhow cruise came to an end. The cruise operator thanked all the tourists for joining the cruise. As we gradually stepped out from the dhow, the staff were standing along the pier, each one thanking us individually. Graciousness, unleashed! Drop to the hotel: As we come out of the pier, the tour guide gets the vehicle ready to transfer us back to the hotel. It is around 10.45 pm when we reach the hotel but at the end of the day I know that the money is extremely well spent and the cruise is worth every paise. To sum up, the Marina Dhow dinner cruise was all about the fascinating and breathtaking views of the skyscrapers on the Persian Gulf shoreline and awesome and relishing international cuisine. Both these made our trip truly unforgettable. On coming holiday my friends are planning for Dubai trip and this information on Marina Dhow cruise impresses us for including a dinner on a Dhow to cruise through “tour-dubai” agency. Hope trip will be great and full of joyful memory. Fatima: I am sure it will be worth it. Indeed this peace of content will guide the visitors to get the maximum joy and entertainment in Dubai Marina Dhow Cruise. I like The Deluxe Trips agency as they served me once..